A new survey reveals a deep disconnect between faculty and librarians. The research, conducted by Gale and Library Journal, highlights the need for faculty and librarians to work together, communicate more, and recognize the value of the library for student success. ■ 27% of faculty think there is no need for campus librarians and faculty to consult one another. ■ 45% of faculty want better communication with librarians. ■ 98% of librarians wish for better communication with faculty. 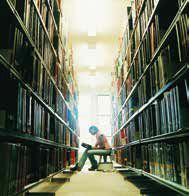 ■ 57% of faculty say they coordinate with librarians on course reserves. ■ 31% of librarians say they coordinate with faculty.